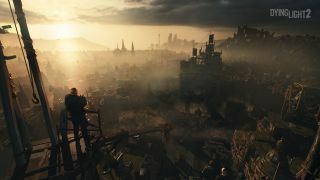 Techland's Chief Creative Officer Adrian Ciszewski has claimed that Dying Light 2’s choices will form the “ultimate vision for the open world”, going far beyond the narrative choice and consequence systems seen in most RPGs. Dying Light 2 certainly made an impression when it made its debut at E3 this year. The announcement that Chris Avellone would be writing the game’s story came as quite the surprise, as did the news that the game would place a much greater emphasis on player choices that will dramatically affect the setting. In a detailed interview with GamesIndustry.biz, however, Ciszewski explained that this emphasis on narrative choices might be somewhat misleading, and that the actual game is more fluid and mechanics-driven than Avellone’s RPG legacy naturally suggests. “We didn't count the number of choices we can do, because it's really systemic," he said. “For example, the Peacekeepers faction—they're clearing the streets of baddies, but they're also clearing the dark zones and the streets from infected. That's a system. "If you tell the Peacekeepers about a building [full of zombies], the zombies will move from that location into another one, but that will create other problems because there will be more zombies in that other part of the city. If the Peacekeepers clear part of the dark zone, it will push the zombies to find another place to hide." In the interview, Ciszewski is keen to emphasise it’s player-driven action that shapes the world and alters the city, rather than decisions triggered by quests and story. As the player interacts with the world and the characters within it, different factions will move into new areas of the city, causing changes depending upon what factions or creatures are already in those areas. These potential changes form part of a “huge matrix” that the players can take advantage of tactically. Apparently this will also work on a smaller scale. If you want to infiltrate a compound belonging to a particular faction, giving those NPCs reason to move into another area of the city will make it easier for you to get inside undetected. It’s worth noting that narrative choices will still feature in Dying Light 2. But Techland is keen to avoid creating choices deliberately designed to wrong-foot the player. Instead, they’ll be more systematised, so that while the choices all have their own moral greyness, the consequences of your decision will always be clear. It sounds ridiculously ambitious, but Techland has certainly sourced the kind of talent that could pull it off. Alongside Avellone, the studio has hired Karolina Stachyra, who wrote the Witcher 3’s incredible “Bloody Baron” questline. It’s also worth remembering the original Dying Light was a strong game at a systems level anyway, so those are good foundations for Techland to build something really special off.